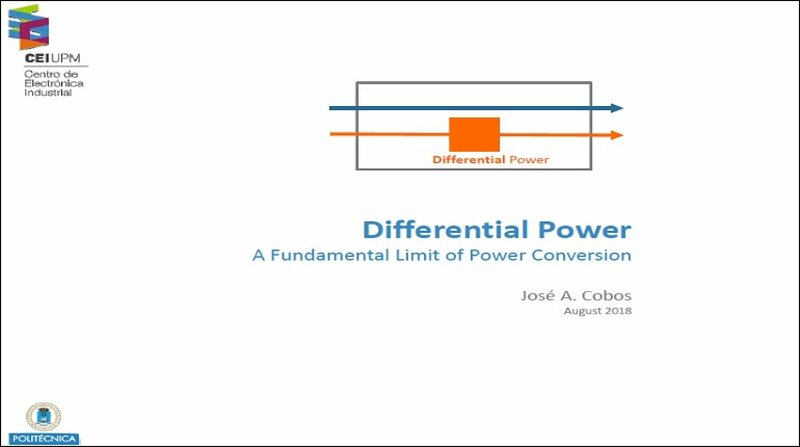 In this talk, the main novelty is the VA interpretation of power conversion, that enables the calculation of novel continuous power models for 2 port and n port converters. This methodology also enables the synthesis of specific power topologies to operate in this fundamental limit of power processing. Key applications are Power balancing between stacked sources (PV cells), loads (data processing cores) or batteries. Partial power configurations may also be assessed with the differential power approach. More relevant is the case of energy buffered converters, as those required in single phase inverters connected to domestic batteries PV panels or those required in AC adaptors and chargers with Power Factor Correction. Three phase rectifiers and inverters may be also be synthesized to operate in the fundamental limit of power conversion. The methodology is illustrated for the Little Box Challenge (Google and IEEE PELS) specification. The differential power is calculated, and compared with the indirect power processed by the main alternative architectures. Finally, an inverter is synthesized to operate in this fundamental limit. © Copyright 2016 IEEE - All rights reserved A not-for-profit organization, IEEE is the world's largest technical professional organization dedicated to advancing technology for the benefit of humanity.